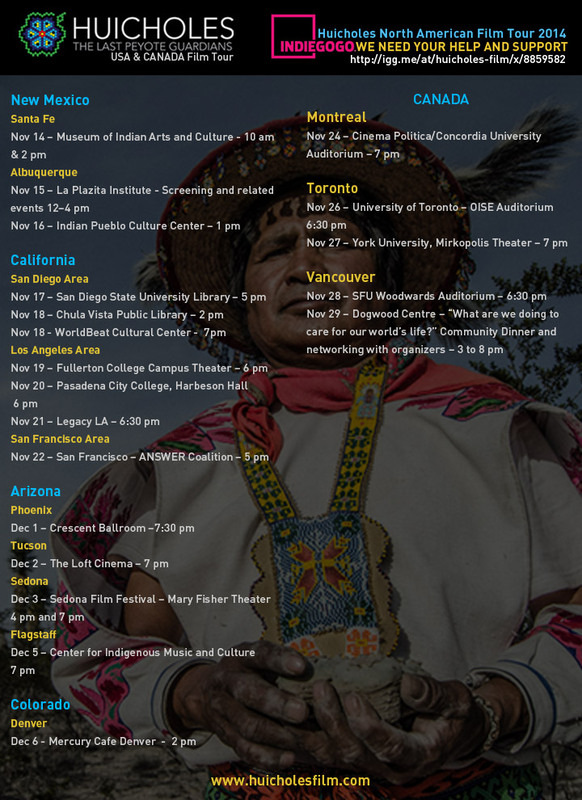 Following the overwhelming response to the first two international presentations through Chile and Northamerica in 2014, we performed a new film tour in Western Europe between April and June 2015, organizing 41 screenings in 37 cities of 15 countries, with a total audience of 4330 people. The tour was again presented by our protagonists and the film´s director in cities like Paris, London, Berlin, Amsterdam, Munich, Innsbruck, Zurich, Wien, Barcelona, Madrid, Oslo, Helsinki, Toulouse, and Edinburgh, with an outstanding resonance both among the public and the press of the visited countries, most of them having their first contact with the Wixarika culture through our movie. 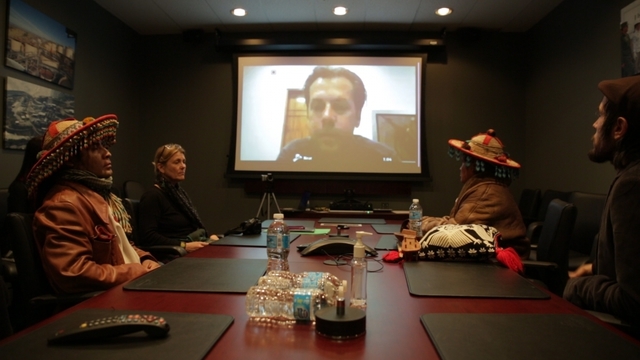 VANCOUVER, B.C., Nov. 28, 2014 –­– Members of the production crew for the film Huicholes: The Last Peyote Guardians delivered a powerful message from Wixarika (Huichol) traditional authorities, revealing that another Vancouver-based mining company, IDM Mining LTD (formerly Revolution Resources) has abandoned plans to pursue a mining project in Wirikuta, the sacred land of the Wixarika people of Mexico, to which they have carried out their pilgrimages since time immemorial. The authorities provided new information regarding the dire situation with regard to water resources in the region and pleaded that First Majestic Silver Corp. follow the example of its competitor. The letter was delivered to the film crew on the eve of their journey to Vancouver to present the film at British Columbia University, Simon Fraser University and Dogwood Centre in three public screenings and discussions. 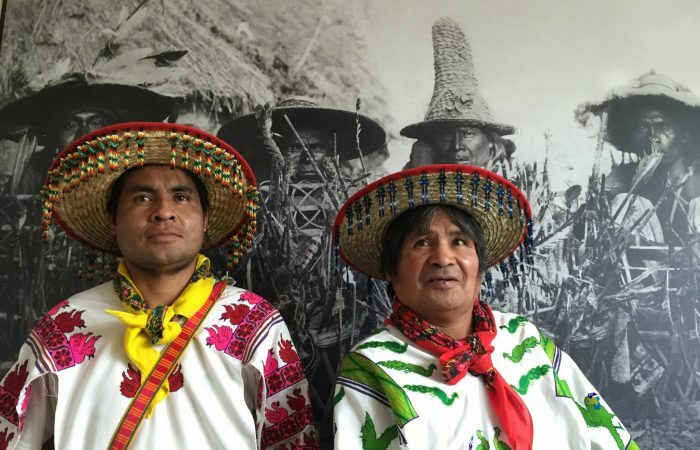 Accompanying the film are Vilchez and two Wixarika marakate or shamans who are protagonists in the film, José Luis “Katira” Ramirez and his son Enrique Ramirez. The letter from the Wixarika authorities emphasized the fragile nature of their sacred desert and the urgent importance of its preservation for the ongoing cultural survival of the Wixarika people, one of the tribes that have most successfully maintained its ancient spiritual traditions. 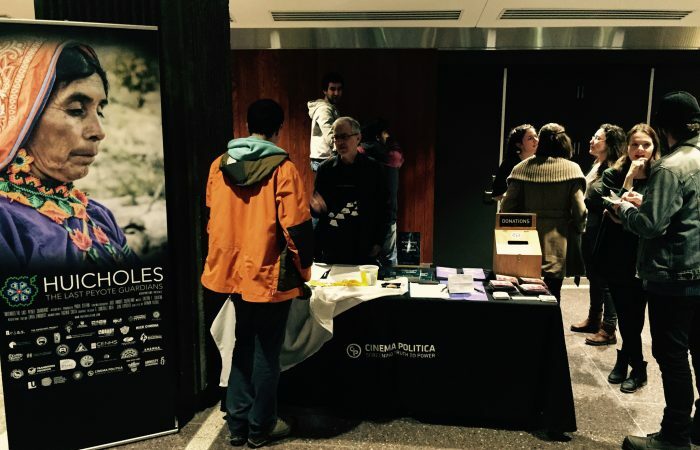 Last night nearly 500 people packed into Concordia University’s H-110 Auditorium to see HUICHOLES: THE LAST PEYOTE GUARDIANS, and for those of us involved with Cinema Politica Concordia, it was one of the most memorable screenings we’ve had in eleven years. 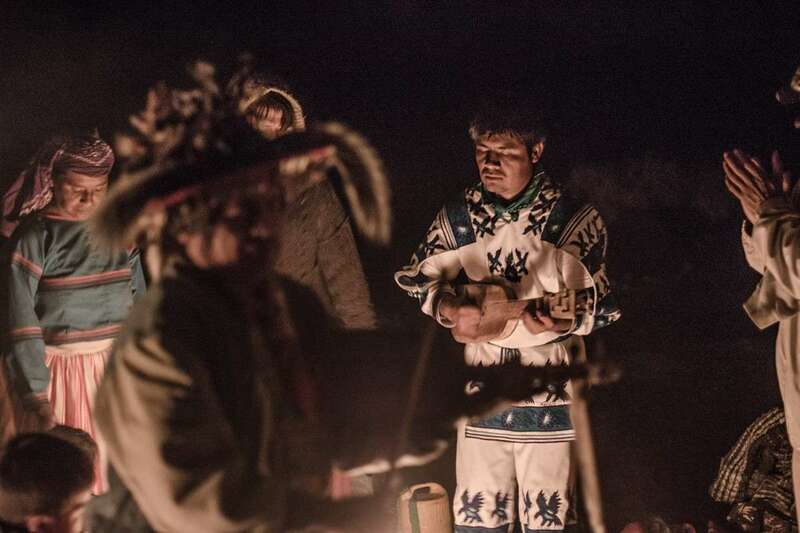 HUICHOLES chronicles the struggles of Mexico’s Wixárika people against a Canadian mining company by focusing on the traditions of intense spiritual connections this embattled Indigenous group has between humans, the animal kingdom and the plant world. 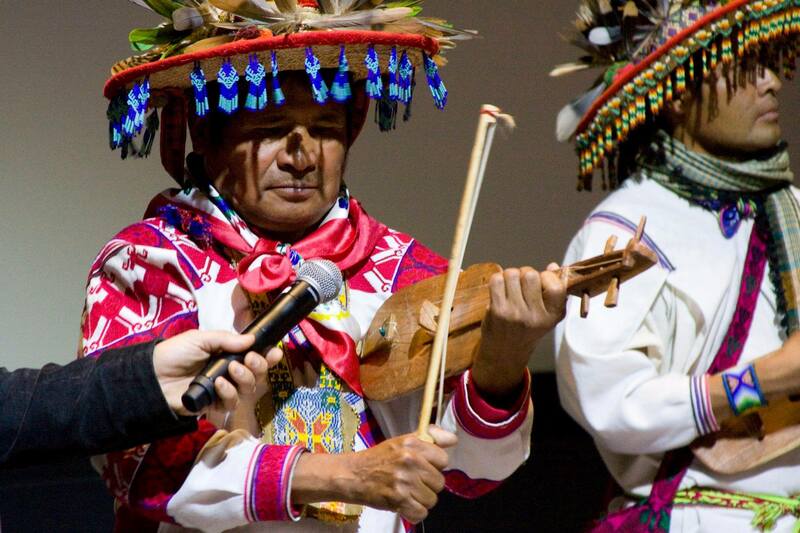 The documentary, which is directed by Hernán Vilchez, was shot over several years with the community and is much more than a document of resistance: it is a breathtaking poem made in honour of the Wixárika people. 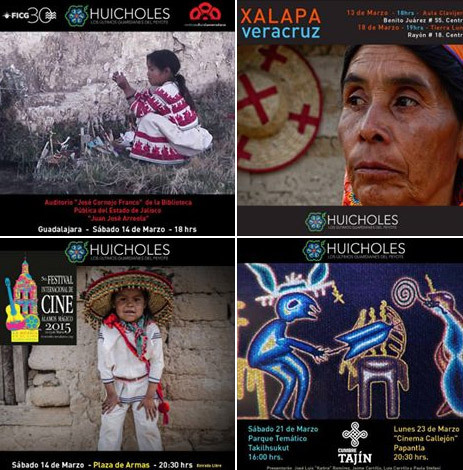 Cinema Politica selected HUICHOLES as one of its main Divine Docs—documentaries that embody the theme of social justice and spirituality—for this year’s edition of Divine Interventions: Documentary, Social Justice and Spirituality. HUICHOLES perfectly and provocatively captures the spirit of resistance and transcendence while offering positive steps toward reconciling humankind’s destructive force on each other and the planet. As such, it is a magnificent film to launch the second instalment of Divine Interventions, which is a sidebar program of films circulating throughout the CP Network between Fall 2014 and Winter 2015, with over 40 CP locals participating. The program also has an online component, where audiences can join in conversation, post reflections, and encounter more related media to the films and their diverse subjects. At the screening last night we were joined by the director, Hernan as well Jose Ramirez and his son Enrique, who are shamans and featured in the film. 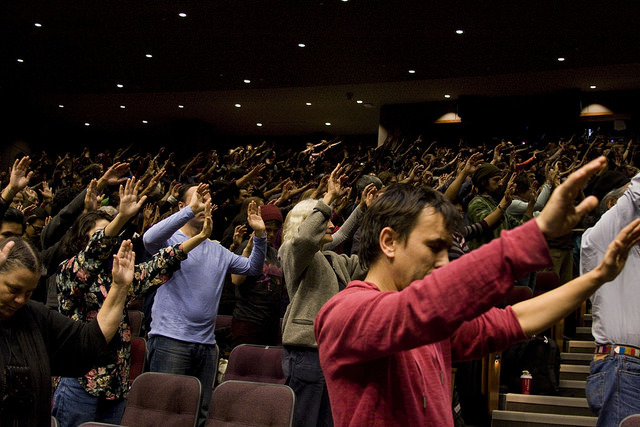 Jose and Enrique performed a sacred ceremony as part of the introduction, inviting the audience to join them in this blessing and giving thanks ritual. They also performed a song on their traditional instruments and afterward displayed their handmade crafts outside of the theatre. At the end of the film, just before the credits rolled, we all watched Jose walk down the aisle to the front of the cinema to stand in front of the bottom of the giant screen in the light of the projector, showing such pride in his work, his people and this fantastic film. Our audiences were clearly moved by this and by the whole event itself, and all leapt to their feet in a lengthy standing ovation that was the perfect show of appreciation and respect. The post-screening discussion lasted over half an hour (not bad following a film that runs over two hours!) and was engaged, dynamic and intelligent: A perfect cap to a perfect evening. Muchos gracias to Hernan, Jose, Enrique and to Tracy Barnett (a journalist based in Mexico who has been helping coordinate the North American tour of the film) for an incredible night that managed to powerfully capture the spirit of our Divine Interventions program and to embody exactly what it is we do at Cinema Politica: create community spaces that are defined not by the material borders around us, but by the imaginations, convictions and dedication of those who transgress borders. In this case it was exactly the moment where spirit meets action, and we’ll never forget it. 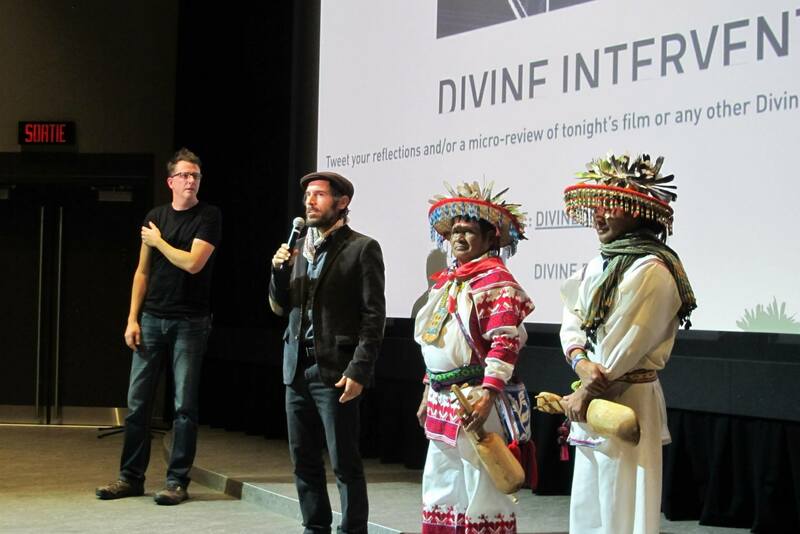 To learn more about Divine Interventions, and how you can win prizes by tweeting reviews and reflections of Divine Docs using the hashtag #DivineDocs, visit divinedocs.com. Oh dear, yet another film about Canadian mining companies behaving badly. As a human being and a Canadian, I am sad that this is such a fertile topic for documentaries. Just a few days ago, I saw Marmato, about disruptions in that Colombian town when a Canadian company started buying hundreds of small gold mines there. 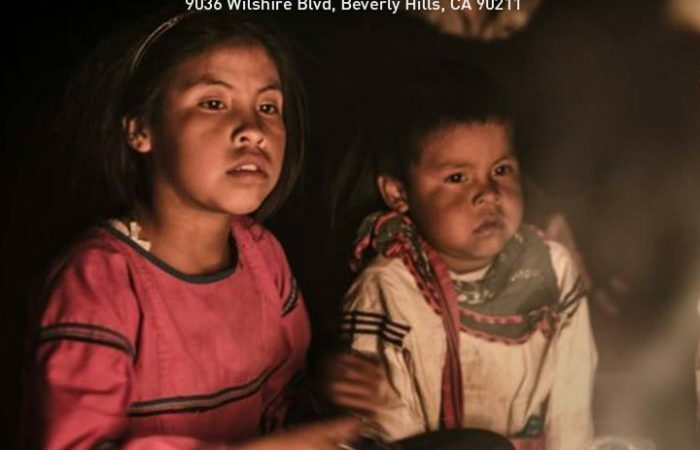 On Monday, Nov. 24, 2014, Cinema Politica will show Huicholes: The Last Peyote Guardians. I haven’t seen it yet, but the trailer looks fascinating. 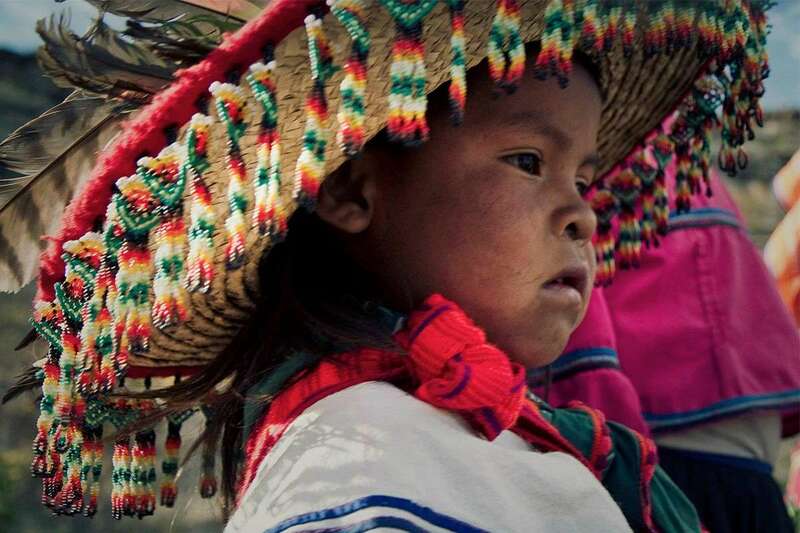 The Huicholes are an indigenous group in Mexico (they call themselves Wixaritari). They have lived in the area between the Sierra Madre Occidental and Zacatecas mountains, in the state of San Luis Potosí, since time immemorial. But the land that is sacred to them and the peyote that they use in their rituals are in danger, because that land also contains gold and silver deposits. In the film’s trailer a man from mining company First Majestic Silver says that the operation could provide jobs for 15 years. (Five hundred direct jobs, and 1,500 indirect ones.) That’s a relatively short time, in the grander scheme of things, and not that many people either, while the price to pay in environmental damage could be quite high. The area is very dry, but mining requires and pollutes lots of water. 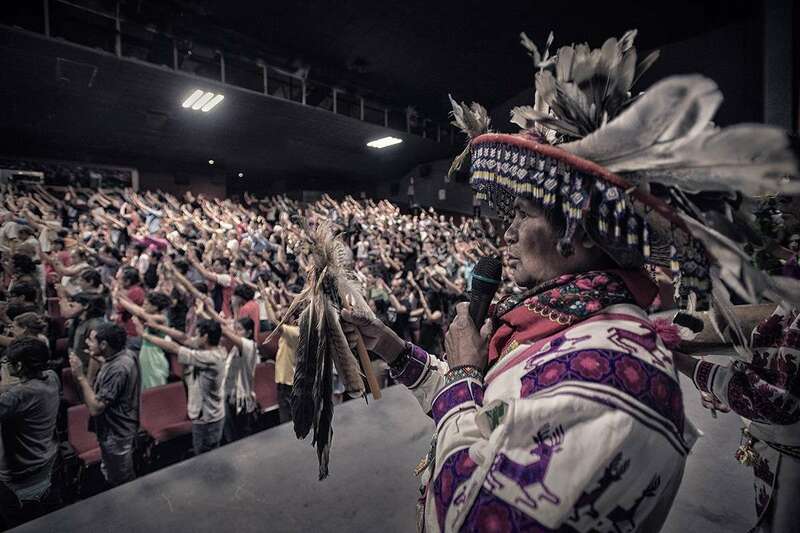 Huicholes: The Last Peyote Guardians received the award for Best Documentary at the Red Nation Film Festival, the premiere festival representing the work by and about indigenous peoples. 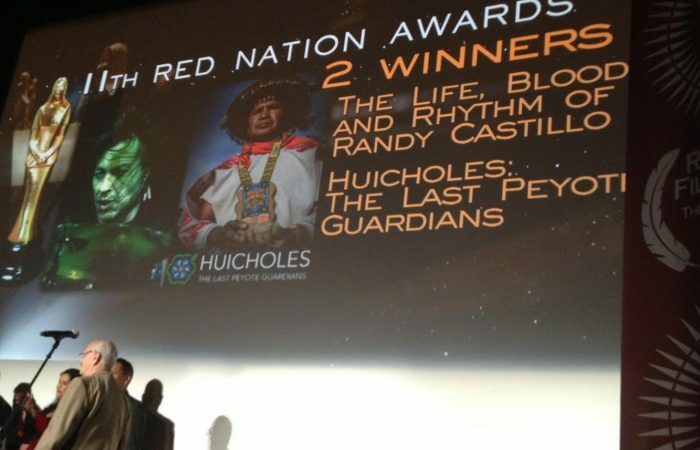 The film Huicholes: The Last Peyote Guardians has won Best Documentary Film by the Red Nation Film Festival, the premier showcase for Native American and Indigenous film in the United States. The award was shared with The Life, Blood and Rhythm of Randy Castillo, by director Wynn Ponder. The selection was the only Latin American film to be awarded. Joanelle Romero, Executive Producer and Founder of the Los Angeles based Red Nation Film Festival, experienced a deep personal connection with the Huicholes film. The California premiere of the film screened at the Red Nation Film Festival in Beverly Hills on Nov. 7 and is making multiple stops in in the greater Los Angeles area, including two events at local colleges and a special community premiere hosted by various grassroots organizations. 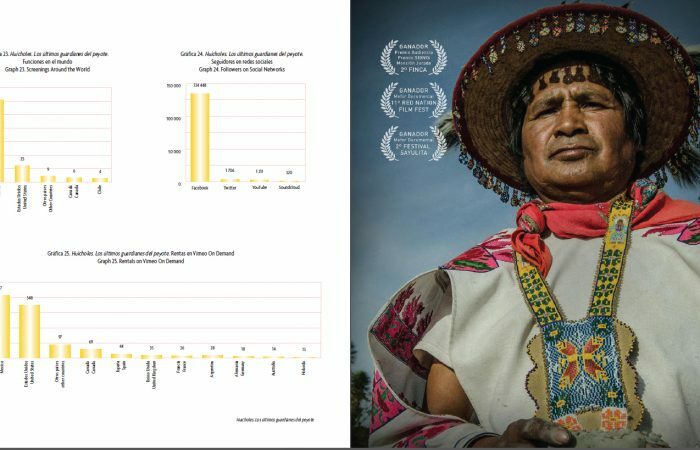 Film director Hernan Vilchez and a Marakame (Huichol spiritual leader), one of the film protagonists, will introduce and discuss the film at 30+ screenings in 20 different North American cities. Its US premiere at Rice Cinema in Houston, Texas, packed the house, and subsequent stops in Austin, San Antonio, Taos, Santa Fe and Albuquerque were similarly well received. The film crew has organized an Indiegogo campaign to cover costs of the film and tour production and to continue carrying the message throughout the world At www.indiegogo.com – search words Huicholes Film. 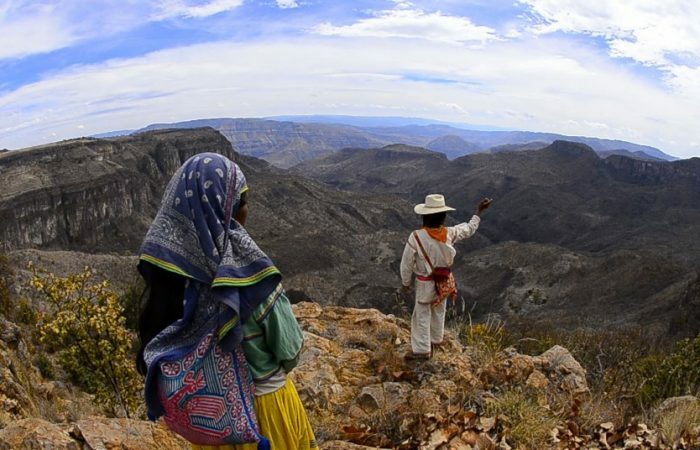 The Wixaritari (Huicholes), are a pre-colonial culture whose territory spans 140,000 hecters (approximately 540 square miles) between the Sierra Madre Occidental and Zacatecas mountain ranges. They Huicholes survived European disease, Spanish Conquest and Mexican societal encroachments, but now they face their biggest threat yet. Canadian mining company First Majestic Silver purchased underground mineral rights in 2009 giving them access to the Huicholes most sacred site at Real de Catorce in the state of San Luis Potosí. The small town of Real de Catorce was founded in 1779 shortly after silver was discovered in nearby mountains but indigenous peoples have lived in the region for thousands of years. The Huicholes are direct descendants of those original inhabitants. One of their ancient traditions is to make an annual pilgrimage to this region where they participate in religious ceremony in a sacred land they call “Wirikuta”. 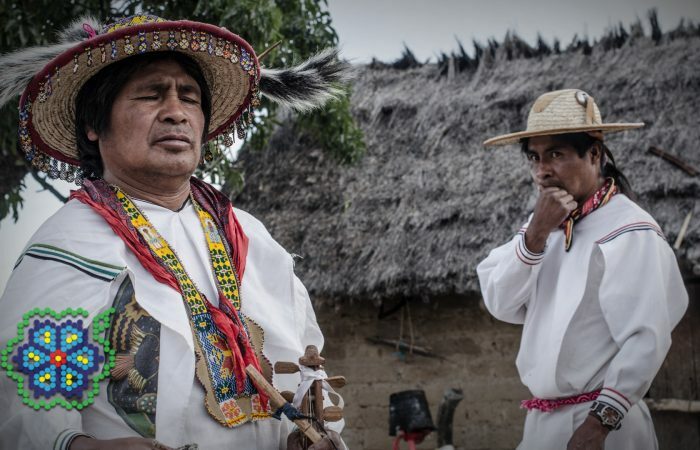 I recently had the opportunity to talk with Huichol Shaman, JOSÉ LUIS “KATIRA” RAMÍREZ about this very topic and the long fight ahead as he and the Wixaritari enlighten us about the importance of ceremony and reverence for sacred sites. 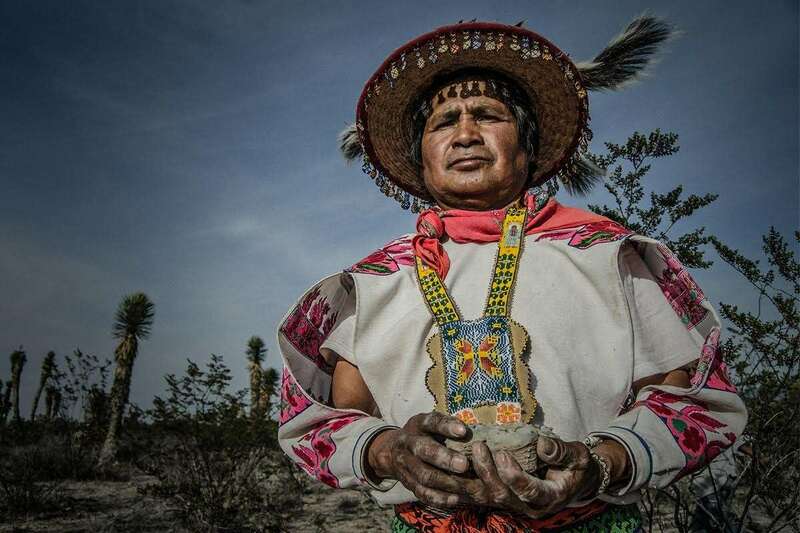 This all comes together in the documentary film Huicholes: The Last of the Peyote Guardians which will make its U.S. Debut at Rice Cinema, November 5th at 7:00PM. The films protagonist Katira and son Enrique Ramirez will be in attendance. Argentine film director, Hernan Vilches will also be in attendance for a Q&A after the film. I spoke with Katira over the phone about the film. HOW WOULD YOU LIKE PEOPLE TO IDENTIFY YOU? Wixaritari – In our mother tongue from where our great grand parents, where our grandparents were born, it is a real name and original name. Wixaritari [is] the name of the people, if you speak of the person, in general, Wixarika. TELL US HOW YOU BEGAN TO NOTICE PROBLEMS IN THE COMMUNITY? So, it has been known for some time, within the 4 major indigenous communities in the area – Santa Catarina, San Sebastián, San Andrés Cohamiata and Tuxpan de Bolaños. These form the four indigenous communities and within this, we noticed territorial problems dealing with sacred sites and communal boundaries between the 4 communities as well. HOW DO THE WIXARITARIA PEOPLE LIVE IN THE REGION? Each community has existed for millions of years since our universe began. We were there since the beginning, not recently, but since the arrival of our essence, since the arrival of the viceroys. At the arrival of the time of the viceroys, they came from the ocean at San Blas, Nayarit, they went to populate different [places] and we now have different ethnicities. 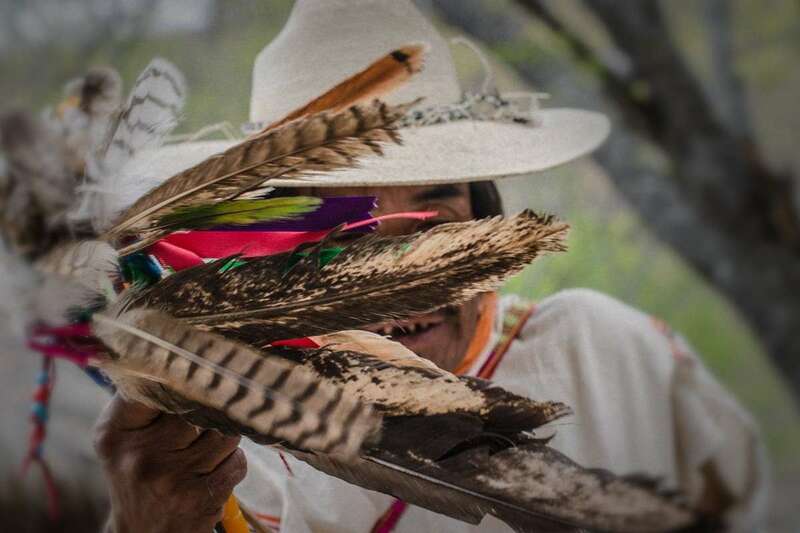 There in that community has important, universal connection with the sacred places, the four cardinal points, and to the center in the place of Tatewar,“Grandfather Fire” at the mountain there [between San Andrés and San Sebastián, in Santa Catarina] and we serve as the responsible ones, the guardians. WHY IS REAL DE CATORCE IMPORTANT AND WHY MUST THE SILVER STAY IN THE GROUND? Yes, well, for us, our greatgrandparents, our grandparents, left there for us the formation of our universe, which we call “Llogachiban”[a university], because there are the books, magically invisible, that can’t be seen, but [are there] for the people who collect the medicine, because with their medicine they have visions and dreams through the universe. Then, the mine, the gold is the center of the heart of humanity. If from me you take my heart, if a temple can be knocked down, well then, that is why we don’t want [Wirikuta] knocked down, we don’t want it worked on, because there will be pollution. We don’t want the little bit of water that is there to become contaminated and furthermore, the damage it would bring to the medicine, and the [toxic] dust, this would harm all the areas where there is medicine. IS THIS THE MESSAGE YOU WANT THE AUDIENCE TO TAKE AWAY? Well, yes, this is what we want everyone to know, all the communities, the international community so that all the children and all the grandchildren can grow to defend the environment. THIS FILM WAS MADE AFTER A DIRECT REQUEST FROM YOU. 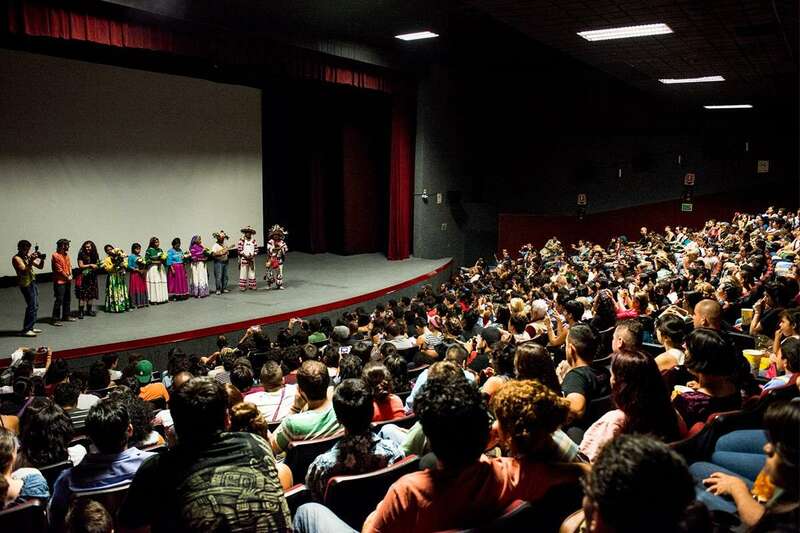 DO YOU FEEL THAT THE FILM DID YOUR COMMUNITY JUSTICE AND HAVE THE OTHER HUICHOL COMMUNITIES SUPPORTED THE FILM? Uh-huh, well, the story is really funny, so we kinda bumped into each other, I don’t know where, I can’t remember, might have been in DF, and we ran into each other and out of necessity, I spoke to him about the community, because there wasn’t enough water and if it were possible to make a documentary about the community. So then, well, he said yes– I will get to work on this, but I have no one to sponsor me on this project, it will take a while, but I will work on it. Later we agreed to get it done and we talked to the community about the topic and people commented; Yes, they wanted to be a part of it, no, some didn’t and so on, but it will turn out to be a good thing, because that way the thing can be recognized and one can support it because many people don’t know about that corner of the world – and that’s the way the idea started. Then in 2009 the whole issue with the mines sprang up, we confronted this and invited the director to the pilgrimage…the next year– and that’s when we started to get to know one another. I couldn’t believe this was going to stir up ideas on such an important topic, a legacy – and we can’t say that is a simple topic to cover, but it is a major documentary. The community has responded well to the documentary and if there is an issue, if someone is not in agreement, I tell them, you think this is easy. This will be a good example, to inform our children, our grandchildren, so that they have something to follow when we are gone, so that they have a counsel, an experience for their future – this is the idea. HOW SPECIAL WAS THAT MOMENT FOR YOU WHEN THE RAIN FINALLY CAME AND HOW DID THAT MAKE YOU FEEL? Well, all the energy of the cosmos and the universe that expanded and moved and brought the rain…the scientists and experts, all of us, began making a little contribution. Thank god, now it has rained a lot. It is important – when you think badly, then bad things happen, when you speak badly, then your parents feel this, when your parents speak badly their children feel the pain of whatever problem. Some places it doesn’t rain, in another there’s an earthquake. When you speak, your voice will be heard by god, and that is when there is change, thank God. WHAT IS THE SIGNIFICANCE OF THE VIOLIN AND MUSIC IN CEREMONY? WHEN DID THE VIOLIN BECOME PART OF THE PEYOTE CEREMONY? Oh, well it came from the beginning, the arrival of the prophecy, that mythology. That essence came from far away, long ago, beyond the world. That essence is from long ago…way before the world came into existence. It came, walking, walking all of the kingdoms came this water, the one that is called “Maxakwaxi” – Whitetail Deer— who was always facing forward, and he arrives at the water’s edge in San Blas, Nayarit, which is at the arrival of all the prophecies, all the people of knowledge, and then there, Maxakwaxi takes out all of the flame with his little white tail, and plants there, different seeds, tobacco, amaranth, the 5 colors of the maize, the power of the authorities. And there, and when he looks, there is a tree, and in the tree there are many different types of birds there, talking, and he says “this will be our magical drum, this will be our magical violin, and so, because of this, if you love a drum, if you love a violin, it will never cease to speak, it is the sound transformed, the song and chirps of birds, guacamaya (scarlet macaw), tzentzontle (mockingbird)—there are three birds that sing a lot—, and so, in that era, everything is born. The maracas, the drums, the violins, the canto (shamanic chants). Then this becomes the sacred seed, the sacred word we call it out of respect. Then, some of us are followers of the ancestors’ footprints, their faces. We follow, we look for this – men of knowledge, of science, depending how you understand it— looking for enlightenment, looking for knowledge, looking for growth, strength for our families. We call it paritsutia the path begins until you arrive at the Cerro del Quemado (the mountain of Wirikuta), which for us is important. Earlier, you asked me how I felt about all this, and I say, how should I feel? How should one feel when you are far from home? Courage and strength is what is required here, especially when one is away from family. Having seen what has been happening in the last few weeks – with what is happening with violence, to women, to what has happened to the 43 education students who have disappeared [in Ayotzinapa, Guerrero], it is difficult. But, I hope that the great father, the great mother, the great son, the spirit, heart of the sky and the earth gives us blessings…to our struggle, our cause, nuestra lucha. Thank you for talking with us, for helping this and for the future of all our families, for the promise of change…long live the spirit. The production team of this documentary started a fundraising campaign through Indigogo to support the United States and Canada film tour. The premiere will be on November 5th in Houston, Texas, hosted by Rice University. 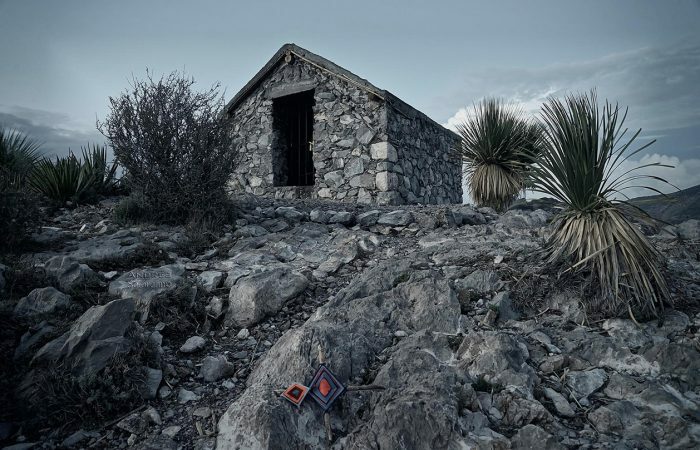 The film, directed by Hernán Vilchez and produced by Paola Stefani, was released at Real de Catorce, San Luis Potosí, Mexico during the month of May of this year. Since then, there have been continuous screenings in Mexico and other Latinamerican countries. Many of these have been presented for free in public spaces, the biggest one being the one at Mexico City’s zocalo on August 28th, with 3000 viewers. Wixaritari (huichol) traditional authorities and people from all of the wixaritari (huichol) communities supported and helped promote the event, trusting it will help protect the sacred territory of Wirikuta located in the dessert of San Luis Potosí, as well as the protection of Mother Earth, an issue that concern everyone living in this planet. Since May of this year, more than twenty thousand people have watched the film. 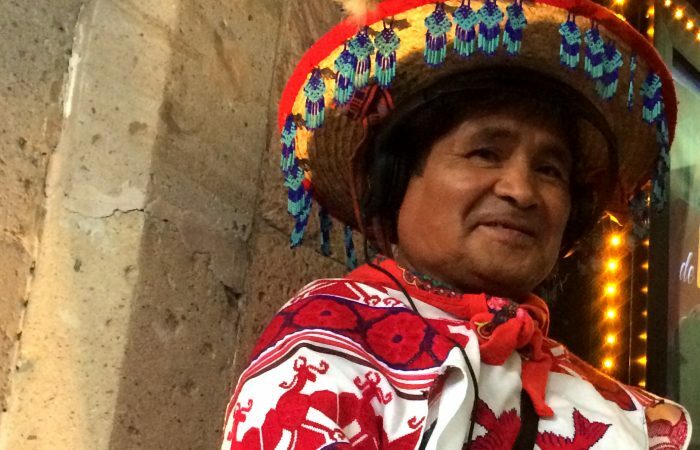 According to the producers, it is time to spread the message of the huichol people in other parts of the world. For this reason, they are starting a journey, along with two members of the Ramirez family (huicholes playing the main role in the documentary), through more than twenty cities of the United States and Canada. Four years ago, the wixárika people publicly spoke out against mining concessions in Wirikuta, requesting their cancellation. These concessions are currently suspended as a consequence of legal complaint submitted by the wixárika people. However, the cancellation has not been achieved yet. 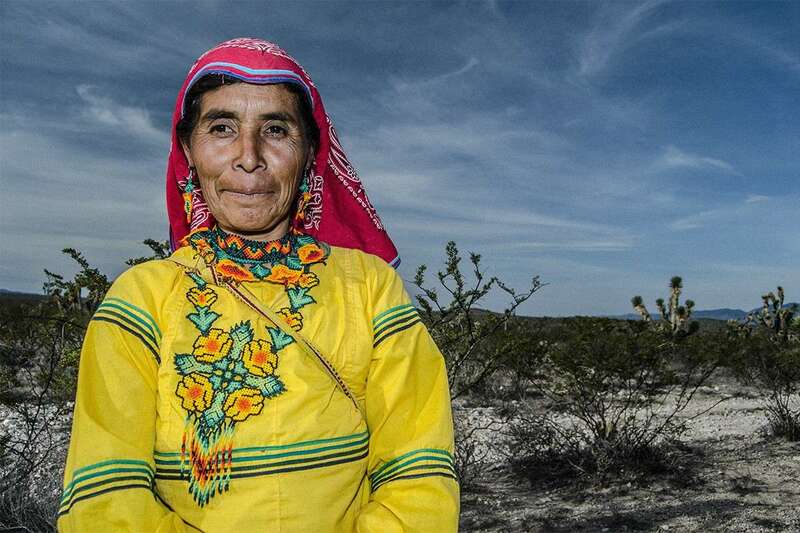 Civil society’s participation in Mexico and the world has been fundamental to sustain the spiritual struggle of the wixárika people, as well as the defense of indigenous people in Mexico. Once more, the support of civil society is requested as well as the collaboration in this fundraising campaign in Indiegogo, one of the most prestigious funding digital plataforms. Economic contributions and help to promote this campaign are requested.